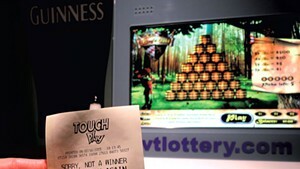 Last November, Shooters Saloon in St. Albans acquired its first Touch Play lottery machine. The gray, 5-foot-tall console looks like a hybrid arcade game and automated teller machine. After feeding it cash, players can try the video gambling games King's Gold and Bank Busters — or buy a conventional lottery ticket, such as Powerball and Megabucks. Shooters owner Doug Grevatt welcomed the chance to become one of 25 Vermont proprietors to host the game last fall. A few months in, Grevatt said that the Touch Play is "kind of boring" but that it's yielded a few $100 winners and brings in a little money from the bar's commission. Vermont Lottery executive director Greg Smith said sales from the games have grossed more than $1,000 per week at each location, but he declined to say how much profit the consoles have brought into state coffers after little more than two months of operation. Despite potential profits, some feel that lottery games have no place in Vermont bars, and were disconcerted to learn that many had already been installed. Last year, the Vermont House voted to ban the practice, but the bill languished in the Senate and never became law. Meanwhile, the state lottery commission dropped off Touch Play consoles at Shooters and other pubs, including Tilley's in Colchester, T. Rugg's in Burlington and McKee's in Winooski, before the year's end. "We were a little surprised, given the fact that the House had taken a vote against putting these machines in bars and restaurants," said House Ways and Means Committee chair Janet Ancel (D-Calais), who sponsored the bill. "The House was pretty strong on that." But Gov. Shumlin approves of the new in-bar games and has a plan for the profits. His administration wants to send at least $1 million of the revenue to the state's general fund to help finance the Vermont Veterans' Home in Bennington next year. The home has long been in search of a new source of funding. Shumlin defends the use of lottery money for noneducation expenses, saying it's essentially new money. "If this was not new revenue created by a new program, the governor would not have proposed it. He does not support using existing revenue streams that flow into the ed fund for purposes other than funding education," spokesman Scott Coriell said. If Shumlin has his way, this would be the first time since 1998 that lottery money would go to anything other than the Vermont Education Fund, a fact that is not lost on Ancel. While she's unsure of whether she'll try again to vanquish lottery games from bars, she is confident that legislators won't approve using lottery proceeds for anything unrelated to education. "I'm totally against it, 110 percent," said House Speaker Shap Smith (D-Morristown). "I don't like expanding gambling, and I do not believe it's appropriate to divert profits from the education fund." The lottery proposal is one of several Shumlin has made this year that legislators are resisting. Others include his plans for a 0.7 percent payroll tax to boost Medicaid reimbursements, a fertilizer tax to finance waterway cleanup and the consolidation of emergency call centers. Speaker Smith said lawmakers will find another source of revenue for the $1 million Shumlin has budgeted for the veterans' home. "This is one area where we will definitely have to do that," Smith said. "That's a nonstarter, as far as I'm concerned." Shumlin has repeatedly said that those who don't like his funding ideas are welcome to come up with their own, Coriell noted. Lottery ads have long urged users to "Please play responsibly," and have touted the fact that "All profits go to the Vermont Education Fund." Lottery director Smith argues that by siting the games in bars, the state is still playing responsibly. And, he says, the money that would go to the veterans' home would be almost entirely separate from that collected at traditional outlets, such as convenience stores, which would continue to go to the education fund. "I don't think there's anything wrong with saying lottery profits go to Vermont veterans and the Vermont Education Fund," he said, adding that in most states such money goes to more than one source. Coriell said the governor will continue to monitor how having in-bar lottery games is working. 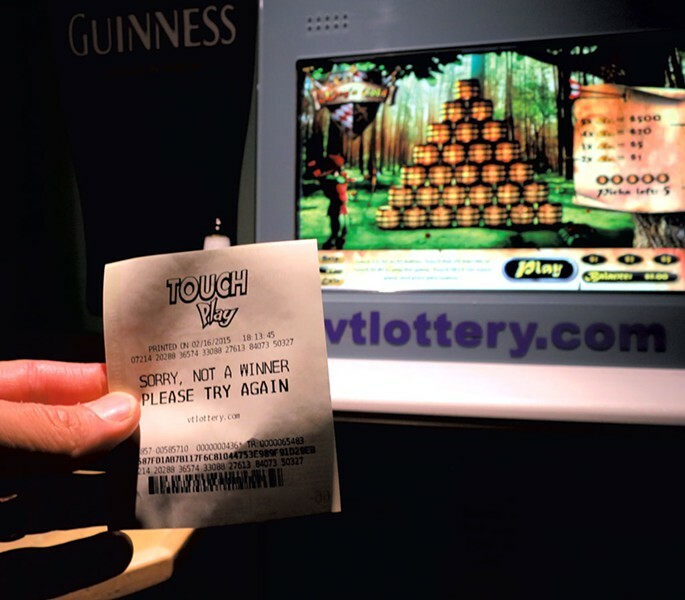 Ancel has concerns beyond gambling in bars; she questions whether Touch Play will deliver the promised revenue and worries that the games will divert money from the education fund by cannibalizing proceeds from other Vermont lottery games. The legislature's Joint Fiscal Office told the House Ways and Means Committee recently that sales from the console games "will likely reduce existing revenues from the lottery to the education fund." The lottery is projected to raise $22.9 million in the next fiscal year. The lottery director conceded that the machines could take some sales away from other lottery agents, as customers might choose to buy Powerball tickets in bars rather than at convenience stores. "I expect there will be a small percentage of overlap," he said. But the machines don't offer scratch-off tickets, which account for 75 percent of lottery sales and should be unaffected by the new outlets, Smith said. People who use the machines are probably there to play interactive touch-screen games such as Cash Vault and Cover All Bingo, he said. He maintains that the Vermont Lottery has the authority to launch new products at new locations. According to Ancel, state law is silent on whether bars and restaurants may serve as lottery agents, but that for 40 years such venues were not included. At Shooters, Grevatt said that Vermont "needs to get in the 21st century." His customers, he noted, are traveling to casinos in New York, Québec and Connecticut. The state of Vermont is "missing out on revenue," he said. One lawmaker — Rep. Ronald Hubert (R-Milton) — has introduced legislation to authorize the construction of a casino in Vermont. The chances of that bill passing? Don't bet on it. The original print version of this article was headlined "Lawmakers Say No Dice to Lottery Machines in Bars"